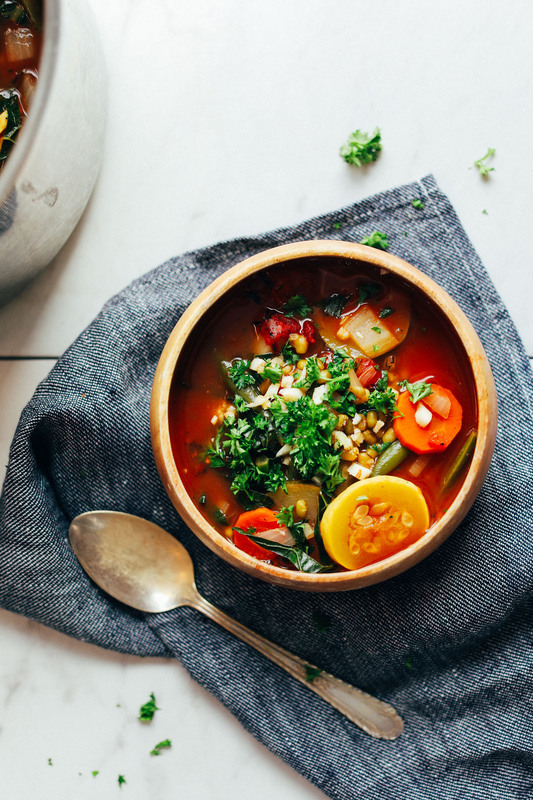 This 10-ingredient, oil-free, grain-free soup starts by soaking and cooking your mung beans. You can soak them overnight, or if you’re in a hurry, you can do it in 1 hour! Once soaked, they cook up in 15-20 minutes. Then your soup is already nearly halfway done. 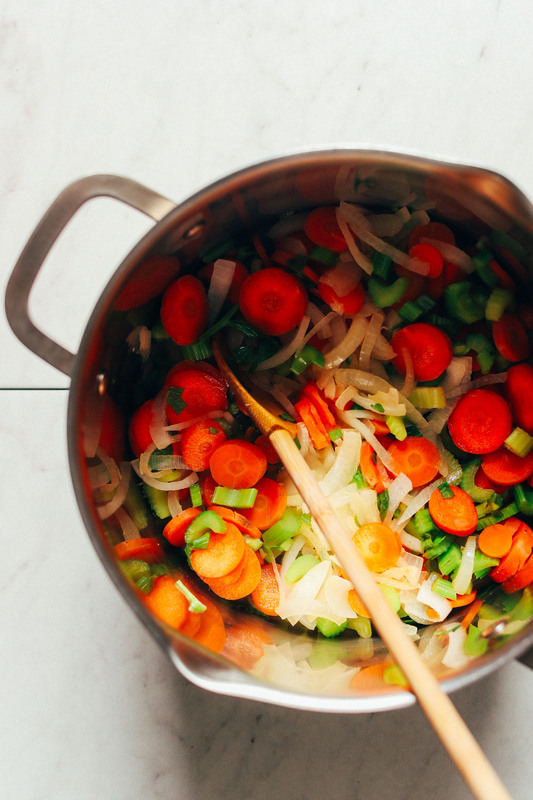 In a separate pot, you’ll add the basics: onion, carrot, and celery. They’re followed by green beans, kale, zucchini, and a wave of flavor with fire-roasted tomatoes and vegetable broth! 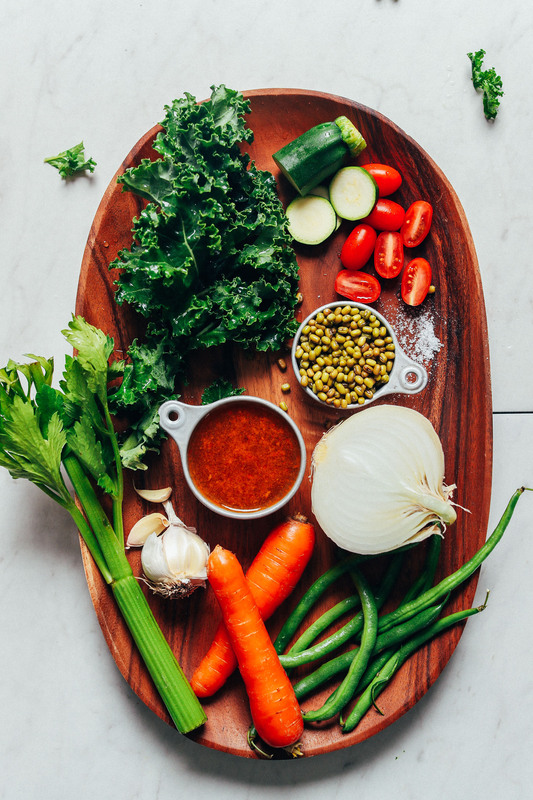 We like making our own vegetable broth, but you can easily go for store-bought to save time (our favorite is the brand Imagine). Once all the ingredients are added, all that’s left to do is let it simmer away to perfection. This is the perfect soup to get you through cold, dark days or when you need a pick-me-up. We reach for this on days when our bodies need a little comfort, and we love making a large batch and freezing it so it’s always on hand. Amplify its nourishing, cleansing effects by topping with raw garlic and fresh parsley. This soup would pair perfectly with our Cheesy Sunflower Coated Kale Chips, Loaded Kale Salad, Garlicky Kale Salad with Crispy Chickpeas, 5-Minute Detox Salad, or Layered Sweet Potato Butternut Squash Tortilla. If you try this recipe, let us know! Leave a comment, rate it, and don’t forget to tag a picture #minimalistbaker on Instagram. Cheers, friends! 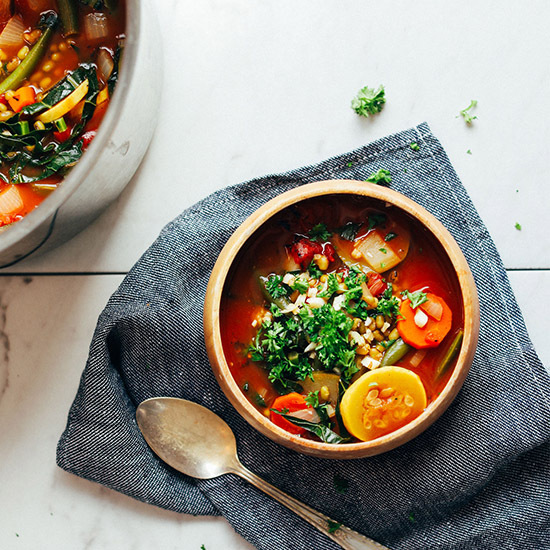 Easy, 10-ingredient vegetable soup with fire-roasted tomatoes, tons of vegetables, and detoxifying mung beans! 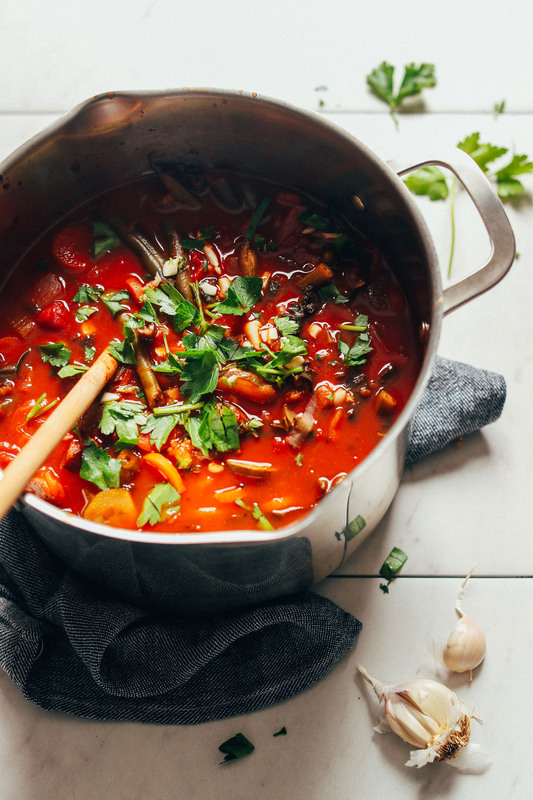 A hearty soup for the colder months that's entirely vegan and gluten-free! Start by soaking mung beans overnight or employing the quick-soak method found in the notes. Then add soaked, drained mung beans to a large saucepan with water (use 3 cups water per 1 cup dry beans) and kombu (optional) and bring to a boil. Reduce heat to medium-low and simmer until tender but not mushy - about 17-23 minutes. Drain off any excess liquid and set aside. In the meantime, heat a separate large pot over medium heat. Once hot, add water and onion. Sauté for 4-5 minutes or until ender and light golden brown, stirring frequently. Add carrots and celery and sauté for 4-5 minutes more or until slightly tender, stirring frequently. 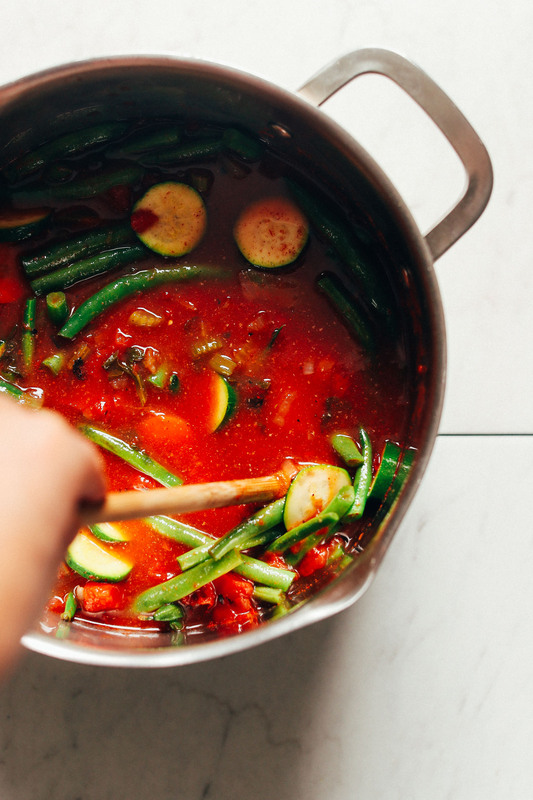 Then add zucchini, green beans, fire-roasted tomatoes, vegetable broth, and salt and pepper. Stir to combine and increase heat. Bring to a low boil. Once boiling, reduce heat to a simmer and add cooked (drained) mung beans. Simmer for 10-15 minutes more or until all vegetables are tender. Add greens and cook 5 minutes more, stirring occasionally. Then remove from heat and let rest 5 minutes. Serve as is or garnish with fresh garlic and parsley for more flavor and cleansing, nourishing benefits. Flatbread or whole-grain bread would make a delicious side as well as the salads linked above. Store cooled leftovers in the refrigerator up to 5 days or in the freezer up to 1 month (or more). Reheat leftovers on the stovetop until hot. *1 quart vegetable broth is equivalent to 4 cups. *If not soaking beans overnight, you can cover the beans with water in a large pot and bring to a boil for 1 minute. Then remove from heat, cover, and let sit for 1 hour. Then rinse, drain, and proceed with cooking per instructions. *Soup highly adapted from the Mung Bean Soup in the book Woman Code by Alisa Vitti. *Nutrition information is a rough estimate calculated without additional sides. Wow! This is really tasty and So healthy. I’ll be making a lot more minimalist baker recipes now (This was my first. 😁) Thank you So Much! Absolutely terrific! I never knew I loved mung beans (or really what they were!) until I tried this recipe. Didn’t have quite enough once cooked, so I added some cooked lentils and quinoa, mushrooms, and a tablespoon of hummus to thicken the soup a little. Also some julienne red cabbage for color and texture, and a splash of lemon juice for a little acidity. Topped it with a dash of sriracha and nutritional yeast to make it a meal. Definitely a keeper!!! Can this be made in slow cooker. We haven’t tried! If you do, let us know how it goes! Do you know if mung beans can be frozen? A coworker just gave me a big tupperware of mung beans that I won’t be able to eat before vacation, so I’d like to freeze them and make this recipe when I return home. Everything I find online is about freezing the sprouts, not the beans themselves. Yes! This recipe in particular can be frozen for up to 1 month, but mung beans in general can be frozen as well. I’ve been wanting to use mung beans for awhile now. I love soup recipes and your recipe and photos look amazing! I love that you add the length of time you can freeze it as well! Mung beans boiling now, it’s cold and raining in the blue mountains in Australia. Perfect for a no get in. I occasionally have a very hard time finding mung beans in the stores that I shop at, they are all sort of hit or miss with carrying them. So I wanted to share that since I have done this with kitchari also, I used pigeon peas instead in the recipe above and it was delicious. They are a good match nutrition wise to mung beans if not quite a perfect flavor match. Just a heads up, if mung beans cannot be found! My grocery store only had sprouted mung beans. Should those still be soaked? Nope! They can go straight into the pot for cooking. Delicious is how I would describe this soup. First time I have eaten the mung beans and I really like their crunch and flavor. 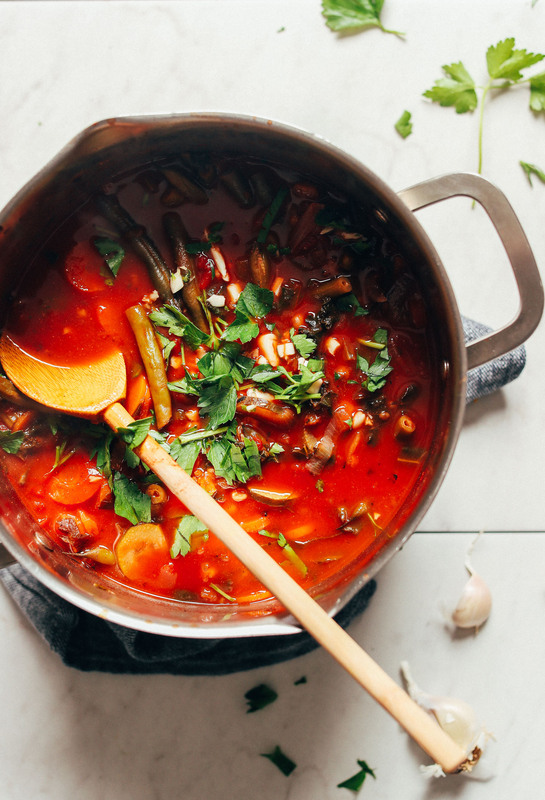 All the vegetables in this soup and the protein in the beans is a perfect meal! Thank you for another winning recipe. You never disappoint. Great soup with a ton of veggies. I am cutting down my red meat consumption so when your recipe showed the amount of protein in mung beans, I knew it was for me. It did not disappoint—-two for one—veggies & protein! Yeah! Glad you enjoyed it, Elizabeth! Wow great video! I loved the music and my mouth is watering! This looks delicious and I love the bowl you put the soup in. Delicious! I’ll cut the mung beans back to 1/2 c. next time as the soup ended up bigger than the pot I have, but it’s very tasty. A keeper! Thanks for creating and sharing the recipe. I’ve been to both grocery stores in my town and neither have mung beans. Is there a substitute I could use? I already bought all the other ingredients and would like to make this tonight. Thanks! Hi Kelly! I would recommend pigeon peas in place of mung beans. As always, wonderful recipe! :) So many hearty veggies – I loved it. Would this work with split mung beans? Maybe if I reduce the soaking time? I think so, but am not sure. Let us know if you give that a try! This soup was delicious, although I couldn’t find fire roasted tomatoes. It was still good with diced tomatoes. I added nutritional yeast on top. This sounds great, but it’s out of season. I think I’ll wait to try it in the summer when both zucchini and green beans are available locally. Made it this weekend – another great MB recipe that will be added to our regular rotation. Used TJ Baby Green Mix for the Kale portion plus plenty of parsley, followed the recipe as written. This soup has wonderful textures, and flavours from the assortment of veggies and as a bonus you get the nutritional benefits the mung beans provide (protein, fiber, antioxidants and phytonutrients) – what is there not to love. Mung beans and sprouted mung beans are super popular in Indian culture as well! Try a mung daal recipe (using split mung beans) one day (I think it goes especially well with broccoli in it)! The grocery store only have dried mung beans… would that work instead of the raw? Thanks so much! Yeah, as far as we know they’re the same! That looks so healthy & good! Soup is about all I am interested on these chilly So. CA days! I hear ya! Hope you love it, auntie! Whoop! Thanks for sharing. Hope you love it! Are the “raw” mung beans the same as “dried” mung beans? Please clarify. Thank you. Yep! And you can also buy already sprouted mung beans, which then wouldn’t require soaking and can go straight into the pot for cooking. My store only had sprouted mung beans. Can you clarify – even if I bypass the initial soak, do I still simmer them with Kombu first? This is next level delicious! I had everything on hand, was craving a really good vegetable soup, saw this post and made it immediately! It checks all the boxes, fresh, substantial, delicious and beautiful! I’m actually really excited to have leftovers tomorrow!! And the raw garlic at the end was such a great touch!! Thanks for sharing! Thanks for posting a Mung Bean recipe! I have some in my pantry that urgently need a home :) Putting this soup on the meal plan for next week.